We are enjoying the abundant harvest of mud and static cling this week. Well, okay, not enjoying it. More like tolerating it. I often mention how much laundry there is to do in the summer months, with filthy construction clothing and dirty gardening garb, but this winter has been no different. Saw dust-encrusted shirts and muddy paw printed skirts are still filling multiple loads, daily. The purchase of construction materials for spring (Vinyl siding! So our house will look like a house!) has put a crunch on our finances for the month, and I remain thankful for every money-saving-penny-pinching opportunity that can be had. These days it feels as if we are short for entertainment around here. Of course, just as I say that, a car will break down or a roof will spring a leak, and things will get exciting in all the wrong ways. So let's focus on quick comfort instead: cupcakes. I have nothing against boxed cake mixes. If I can get one on sale plus a coupon, then it's cheaper than dipping into my own stash of goods and I'm all for it. But this is a nice quick cake recipe that you can throw together in the time it takes to rip open a package. And it does have that homemade taste. The great thing about a cupcake is that everyone can make it however they like best. 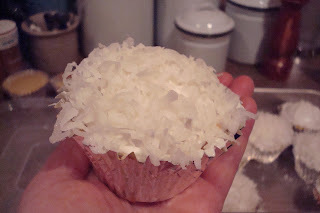 I love coconut, but the Mister does not, so this is one way of getting my coconut fix. Cream shortening and sugar in mixer. Add and stir remaining ingredients. Fill cupcake foils or papered pans 2/3 of way full. Bake at 350 for 25 minutes. Ice and enjoy! Beth, that siding probably won't go on until sometime this summer, but I will be much more open to the idea of taking a picture of our house once it IS on! I really don't understand why people use boxed mixes, look how few ingredients you need to make from scratch and the taste is soooo much better. Why do I use boxed? My homemade anything just about tastes strange, or is as dense as the fog gets around here. Yummy!!! I am collecting recipes right now for scrach foods, and this one is being added to my collecction. And oh that picture with the coconut....so cute. We are getting the same mud here dear. After the snow melted this weekend, then we got rain, and now more snow. UGH! I love the snow, just not the mud. Hmmm.. I don't think I've ever commented on your blog, but I do enjoy it!